White-faced whistling ducks average 15 to 19 inches in length and weigh between 1 to 1 ½ pounds. Males are usually smaller than females. 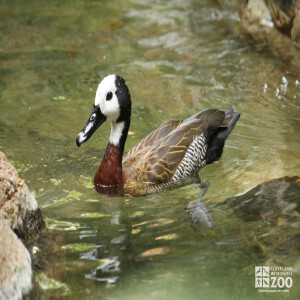 The name white-faced whistling duck comes from the bird’s white face and its characteristic three-note whistle. The bill is black, while the throat is white. The back of the head and neck are black. Legs and feet are gray. The lower neck, chest and back are rust colored, while the sides are narrowly barred black and white. The young are dark brown above, creamy yellow below with creamy spots on the back. They are long-legged and long-necked ducks. Predators include birds of prey and carnivores. White-faced whistling ducks are found from Costa Rica southwards to northern Argentina and Uruguay. In Africa, they live south of the Sahara from Senegal to Ethiopia and to Southern Africa. They also live in Madagascar. White-faced whistling ducks live in a variety of wetland areas. They prefer bodies of freshwater in open areas. They sometimes live in very small bodies of open water. The White-faced whistling duck is highly social with flocks often numbering in the hundreds. In the non-breeding season the birds roost on banks, preening themselves and each other. Mutual preening is highly developed with this species. Foraging is done primarily at night. Normally this duck does not migrate, but flocks will travel considerable distances to find suitable feeding areas. Their flight is slow and heavy with rounded wings. They swim and dive well.These ducks are very tame and do not disperse when hearing gunshots. Mutual preening is an important part of pair-forming and pair-maintaining behavior for White-faced whistling ducks. The nest site is a depression in dry ground or in reed beds over water. Few or no feathers are present in the nest. Incubation is performed by both sexes. The ducklings are kept hidden among water lilies and reeds. These ducks are primarily night feeders, and the mainstay of their diet is vegetation such as grass, seeds and rice, as well as aquatic invertebrates. They are particularly fond of seeds and fruits of water lilies. 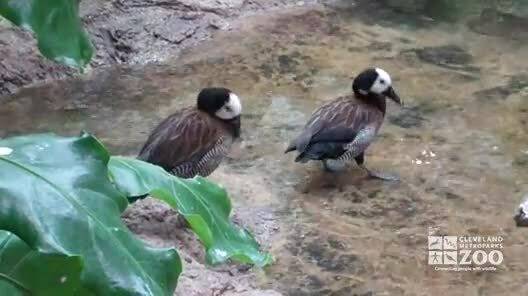 White-faced whistling ducks obtain their food by dabbling and diving.